Mick Martin was born in Dublin on 9 July 1951. He is the son of former Irish international Con Martin and he first came to prominence through that great football academy, Home Farm. Martin was an established midfielder with League of Ireland club Bohemians when Manchester United manager Tommy Docherty signed him for a transfer fee of £20,000 January 1973. Mick Martin made his Manchester United debut immediately on 24 January 1973 against Everton. Reds legend Bobby Charlton was part of the team that day that drew 0 - 0 at Old Trafford with the Merseysiders. United were involved in a relegation battle at the time. Martin retained his place for the rest of the season. Mick Martin scored the first goal for Manchester United on St Patrick's Day against Newcastle United. It was a vital winning goal in front of more than 48,000 fans at Old Trafford. He repeated the feat on 7 April in a 1 - 0 win over Norwich City. Despite failing to win any of the last five matches of the season United avoided relegation. In September of the 1973/74 season Mick Martin fell out of favour with Docherty and lost his place in the team. As United found themselves involved in another relegation battle Martin fought his way back into the team for the final run-in of matches helping United to win matches against Sheffield United, 1 - 3 away to Chelsea, and a 3 - 0 home win over Everton. It wasn't enough and United were relegated to the old Second Division. As Tommy Docherty sought to rebuild the team for a swift return to the top flight Martin became something of a peripheral figure. He played just nine matches in the 1974/75 season. 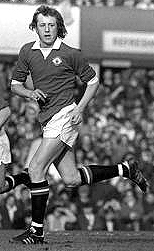 Mick Martin's last match for Manchester United was as a substitute on 31 March 1975 in a 3 - 2 win over Oldham Athletic at Old Trafford. Mick Martin left Manchester United in December 1975 to join John Giles' West Bromwich Albion. New Irish manager Liam Tuohy gave Mick Martin his debut for the Republic of Ireland on 10 October 1971 against Austria in a 1972 European Nations Cup qualifier in Linz. Austria trounced Ireland 6-0. Martin scored his first international goal for Ireland on 18 June 1972 against Ecuador in Brazil's Independence Trophy. He scored a further three goals for Ireland during his international career, the last coming against Bulgaria at Lansdowne Road (now Aviva Stadium) in a 1980 European Championship qualifier. Mick Martin won his last cap for Ireland on 27 April 1983 against Spain.